I have just read this very interesting post from Sitearm discussing the pros and cons (well pros mostly!) of using Viewer2 with new student users of Second Life. It certainly gave me food for thought as I reflect on my own experiences of teaching in SL this semester. Our course this semester was taught partly in RL by me (on campus in the computer lab), partly in SL by a staff member (from a remote location) and assisted in both places by a third on-campus staff member. Each of us had our own ‘preferred viewer profile”. I have yet to make a successful transition to V2. Apart from early trials I have used it only when I have had no other option and it has not yet become intuitive for me. I am still at the “where do I find xxxx?” and ‘grrrrr this sidebar!” stage. A long term user of the old viewer, I eventually moved to Imprudence as I explored OpenSim and began the laborious process of exporting objects from Second Life. My colleague, like Sitearm, saw the writing on the wall for the old viewers and made a conscious decision to learn and use Viewer 2 from its early days. Although he also uses other TPVs particularly for exporting to and accessing OpenSim grids, he is an experienced and comfortable user of V2. Our assistant has only ever used V2! The students themselves came from two quite different programmes and with different levels of technical ability. In addition, some students from the IT degree programme had their own dedicated laptops (on which they have administrator rights) while the others only had access to the institutional computers (unless they downloaded at home on their own personal machines) which were locked down and ran only V2. Just to complicate the issue a little more, some but not all of the IT students had already used Second Life and had v1.23 or some other TPV installed. While it was clear that most of the students would be using V2, I chose not to enforce it as the ‘only’ viewer – partly because of my own preferences and partly as we would have no need for the additional functionality – moap for example. So at any time when an inworld class was happening, it was not unusual to have some students using V2, some using v1.23, some using a different TPV and on occasion some switching from V1.23 on their laptop to V2 on the lab computer depending on what they were trying to achieve in Second Life. Chaos? Maybe but nothing that seemed too problemmatic. Yes, I struggled to help some students with basic V2 UI issues and yes, it was sometimes confusing for my remote colleague not knowing which viewer a student was working on but in general, it was a non-issue. I liked to see the diversity in the classroom with those students who had a choice making their own decisions about what to use for which activity. In the future? I think it will depend on the students themselves but as next year’s offering will take us beyond Second Life into other virtual world grids I think I will be looking to have one of the TPVs as our ‘default’. However, I have realised that I personally should update my V2 skills *sighs – perhaps I will come to love it! Would love to hear your ‘viewer in the learning environment’ experiences! Ever since the last few months of the SLENZ project last year, we have been hoping that we would be able to keep the team together in some way and make good use of all the good things we learnt and the skills we acquired. Being a group of educators and virtual world enthusiasts scattered throughout New Zealand the obvious way to do that was virtually but we also needed an RL presence that would allow us to chase funding and gather donations. 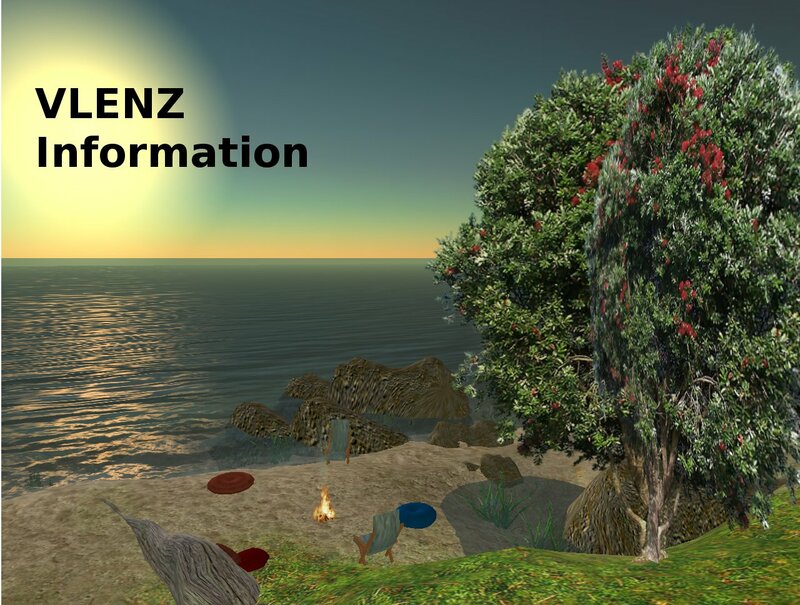 Virtual Life Education New Zealand more usually known as VLENZ was conceived by the SLENZ team members and supporters as the natural successor to our successful project. Thanks to the generosity of NMIT, we were able to pay the necessary fees to establish VLENZ Inc as an incorporated society which had its first AGM tonight. Now the officers are confirmed we can register for charitable status which should be forthcoming in a few weeks. We knew from the beginning that VLENZ would need to operate primarily within the virtual environment and various changes to the standard incorporated society rules were made to recognise that society members would meet as avatars rather than face to face – quite a challenge! At the AGM which I chaired tonight we needed to ensure that all the records were kept according to our rules, particularly those concerning attendance and confirming that the avatar truly represented an RL individual who was a voting VLENZ member. At the same time of course we had to protect the privacy of our avatar members in line with the SL Terms of Service. I think we achieved it and I am left wondering how many others have been faced with this challenge and what their experiences have been. But it has been worth it! We now have an officially constituted society that is committed to exploring, supporting, mentoring, advising New Zealanders on as many aspects of education in MUVEs as we can manage. We have a broad skill set, a ton of experience and cartloads of enthusiasm and we are ready to boldly go! But most of all we share a common sense that the use of multi -user virtual environments will change forever the ways in which we teach and learn. I have lost track of the number of times over the last few weeks that I have been somewhere in the OpenSim grid and heard someone say “This is like SL in the early days – I love it”. This resonates for me – and I have been thinking about why. Since my first encounters with OpenSim in 2008 I had understood the vast potential that it offered but my experiences within it were frustrating, silent and lonely. I had little patience with textures that wouldn’t stick, with crashing sims and unresponsive scripts and most of all with the constipated duck waddle of the default female avatar. Second Life offered so much more for me and my teaching in terms of rich content, community and engagement. Finally – it all comes together! Midwives and SL. This section provides a little background to the Development Roadmap. Please see the other postings for details of the three main phases. If you would like a copy of the whole document please leave me a message and I will get it to you.